This is #11 in a series of blog posts on my 15 most effective sales tactics. If you’re not interested in the two biggest mistakes companies make with inbound leads then skip to the next part of this blog post on the three best times to re-engage and inbound lead. The biggest inbound mistake I see companies make is they don’t’ pass inbound leads onto sales. They have this perspective that you never have a salesperson call an inbound lead because the prospect is “not ready to buy”. They ply them with more and more and more content hoping one day they will pick up the phone and call in. Typically, your first few pieces of content provide the most value to the reader and they get read. Unfortunately, the more content you send, especially if you’re sending content more than once a week, the less valuable the content tends to be and eventually, inbound leads just get annoyed by your emails and they unsubscribe or even worse mark them as SPAM. 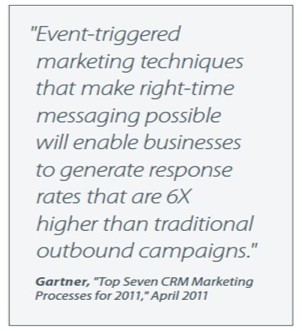 Research by Gartner shows that right time messaging gets a 600% higher response rate than real-time messaging. One of the biggest reason right time messaging – saying the right thing at the right time – is so effective is that the message is more relevant to what is happening to the decision maker right now. Especially if it’s related to something on their list of things to get done but they haven’t gotten to it yet. Real-time messaging can be emailing, calling in or leaving a voicemail that is the next in your sequence of calls to make. It’s not effective because it’s not relevant at that moment and because it’s not relevant it doesn’t get the prospect to take any action. I’ll write more about how to leverage real-time messaging in a future blog post. One of the two things I agree with the Challenger Sale is that by the time prospect calls you it’s too late to impact their decision-making process. The other thing I agree with about the Challenger Sale is that ‘mobilizers’ are the best people to sell to. For those who are new to my content, mobilizers are most likely to be decision makers – VP’s or higher – who are new to their job. Besides my experience and that of the vast majority of my customers, one of my external data points for this is the work done by Discover Org that suggests that 80% of decision-makers new in their job, who will spend $1,000,000 or new initiative in their first 12 months, do so within their first 90 days! The second biggest inbound mistake I see companies make is they pass all inbound leads to sales. This is the other end spectrum and while not as bad as mistake number one it’s pretty close. Here salespeople are stuck trying to figure out which leads are worth following up on. When they do follow up they typically only follow up once and they take way too long to do so. 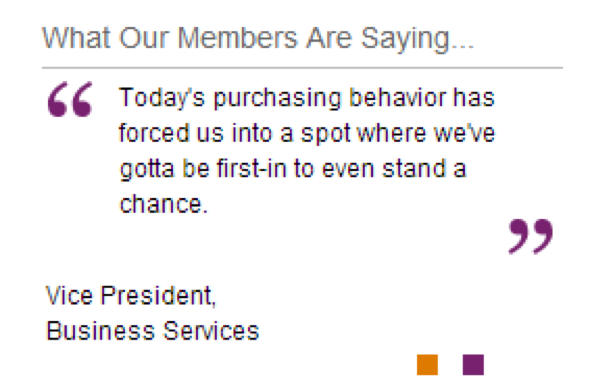 AND when a salesperson phones back in six months the decision maker has already made a decision. Even if the salesperson phones back five months later instead of six a decision has already been made and the opportunity is lost. I have a solution to this problem that I’ll write more about in the future. Feel free to call me if you want to know about it sooner. My suggestion is to have a dedicated person or team call inbound leads back within 5 minutes, of them filling in the form, and ask three questions to learn if they are a hot prospect or a time waster. Now that someone has engaged with an inbound lead once when should they re-engage them? Just like when you wait for someone to call you – see above – whatever your scoring threshold is when it’s reached by a prospect they are most often a complete waste of time. I say this because unless you reached the decision maker first, helped them to define their problem and then worked with them to design what they see as the best solution, they’ve already built a trusted relationship with someone else they prefer to do business. This is often the person they see as the least risky alternative. This is important because as decision makers move through their buying cycle they become more and more risk averse – see the red curve below. The only strategy I’ve seen effectively work here is to be the least risky choice alternative and keep calling back to see if their preferred choice has let them down. Once they’ve been let down, they become even more risk-averse, and since you’ve positioned yourself as the least risky alternative, you become their new preferred vendor. The reason they’re viewing this content is that they’ve had the second of three trigger events – an afford event and now they can afford to buy your solution and/or can afford the time needed to further investigate it. This is the last step in their buying cycle and they are trying to justify their purchase to themselves or others so they can complete the buying cycle and have a new and improved Status Quo. Not being able to justify a decision to others is the #1 reason deals die! This is where I use a RIPES model to understand the factors decision makers use to justify their decision of who buy from. How can I not put my job, reputation, or career at risk? How can I look good to others – in person or on my LinkedIn Profile? How can I get more ‘stuff’ done without spending any more money? How can I spend less money yet still get the same amount of ‘stuff’ done? How can I solve this problem now while I have 10 or 15 minutes to work on it? Here the original decision maker has left the company and a new person has taken their place. Sometimes this can be a good thing because one bounced email can be turned into four hot prospects using this approach. Blog post #4 in this series explains how this works and how following a list of just 100 decision makers can result in almost 1,000 opportunities in just 24 months. In my next blog post, I’ll share the 3 best questions to ask your competitors customers so you can create dissatisfaction with your competition.